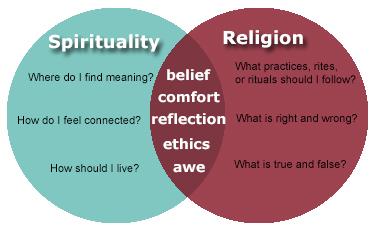 Spirituality and Religion: How Do They Overlap? Oh, such huge questions! I wonder if they are truly answerable? The image comes from this web page. I consider this a challenge to try to answer these questions, at least in a partial way. And, of course, experience tells me that once I’ve settled on a answer, life changes and therefore the answer changes. Three Questions that Spirituality asks: Where do I find meaning? How do I feel connected? How should I live? Three Questions that Religion asks: What practices or rituals should I follow? What is right and wrong? What is true and false? The Intersection of Spirituality and Religion: Belief. Comfort. Reflection. Ethics. Awe. Next Next post: Who Will Stop the Rain?